Through increased regulation restricting and even outlawing open burning in some regions, along with more advanced farming techniques over the last few decades, there has become an increased volume of organic waste. Because of the ENVIROSAVER and CARBONATOR’s design features debris from the harvesting process of vineyards, cotton, fruit, and nut tree waste can now be converted in to biochar, offsetting or even eliminating in very high fertilizer costs. ROI’s track mounted systems with automatic biochar extraction gives our customers the ability to carbonize their crop waste in the fields, or at a centralized location. 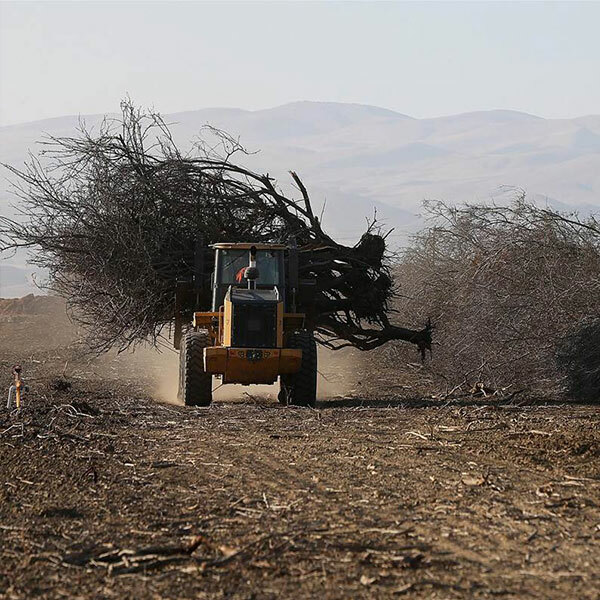 Large debris such as fruit and nut trees can be removed from the soil and placed directly in to the systems primary combustion chamber, converting entire orchards in one pass in to a high value soil additive.